Cherbourg is a town with the reputation amongst Irish of being nothing more than a port by which you arrive in France and promptly keep going. But the town has many charms and it’s war-induced ugly rebuild has received a smartening up in recent years, thanks to some decent funds being put their way. The result is a town that will surprise most people and their varied markets – with their fresh food produce from the rich Norman pasture-land and some of the finest seafood farmed on the noble coastline of this proud historic town. The main market in Cherbourg is on every Tuesday, Thursday and Saturday at the Place de Gaulle in front of the main post office (La Poste, in case you didn’t know). About one hundred stalls are present, so it is a large one (though locals will tell you that the ones on Thursday on Saturday are the bigger ones). Here, you’ll find fantastic fresh fruit (apples the speciality in these parts), locally-grown vegetables, cheeses, charcuterie, fish, crustaceans and shellfish and there are plenty of stalls allowing you to snack for lunch too, as well as the square itself having a few nice options for lunch; sitting outside watching the market in action. It runs from 08:15 to 16:15 from December to February inclusive. For the rest of the year, the same market is open from 08:15 to 17:15. 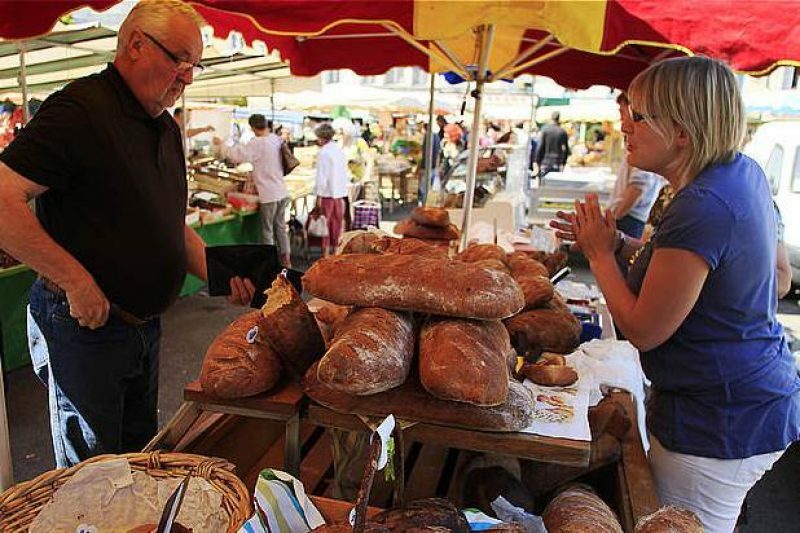 Over on Avenue de Normandie, there is an even bigger market held every Sunday throughout the year. Similar produce is on sale again at about 115 stalls, selling everything at the Place de Gaulle market plus live farmyard animals and a variety of manufactured items including lots of clothing. Hours are from 08:30 to 13:30. There are two smaller markets that both sell foodstuffs and they are on every Wednesday from 08:30 to 13:00. The one on Place Alfred Rossel in the twin commune of Octeville has four stalls selling local fruit and vegetables, whilst the one on Place Jean Moulin sells cheese, fruit and vegetables.